Throughout the 1970s, Roger Moore often wore horsebit moccasins. The style was first created by Gucci in the 1960s and reached its highest popularity in the 1980s. Moore’s examples are most likely from Gucci. Whilst he did wear shoes by Ferragamo, it is unknown if any of his bit moccasins came from there. But by the 1980s Moore had given up horsebits for more conservative slip-ons. Moore wears his horsebit moccasins in black, dark brown, tan and tobacco suede with his suits and sports coats. His shoes have leather soles and a very tall heel. 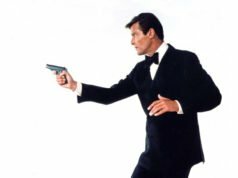 Ian Fleming’s Bond was known for wearing slip-ons with just about anything, and that aspect carried over to Roger Moore’s Bond. However, Fleming and his James Bond character would likely dismiss the shiny horsebit as too flashy and vulgar if they ever saw such a shoe. 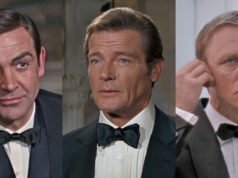 Robert Wagner (who always reminds me of a kind of American Roger Moore) was also partial to these. He wore them quite a bit as Jonathan Hart in the TV series "Hart to Hart" which I recently caught up with again. In the play and subsequent movie, Frost/Nixon the horse-bit loafers are a (minor) plot point. I saw the play a couple weeks ago, and the heel of the shoe is quite distinct, its a little tall.